he killed it and opened it only to find—nothing." 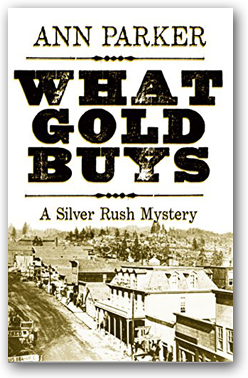 It was hard to find somewhere close by the crowded silver mining boomtown to practice killing a man, but Antonia was nothing if not determined. After trudging up hills and skittering down slopes, the dusty smell of broken sage chasing her all the way, she'd arrived at her place—her place—where no one would find her. Here, Antonia felt safe. She had the targets. She had the gun. She had the rounds. Now, to practice, so that she'd be ready. Ready when the time came. Three cherished glass bottles stood side by side on tree stumps in the clearing. Antonia knew them all. One was a soda bottle she'd pulled out of the trash behind Schmidt and Aldinger's soda water manufacturing on East Chestnut Street. One was a cracked whiskey flask given to her by Mr. Jackson from the Silver Queen Saloon. The last was her mother's tonic bottle snitched from under the bed. One, two, three. Like soldiers lined up on the firing line. Or maybe like her maman's clients, who came to the oneroom shack with the sign FUTURES AND FORTUNES TOLD nailed to the eaves, hoping for a glimpse of a brighter tomorrow. The first ones to arrive each day were the women, many of them hungover, misused, abused, who crept out of their tiny shanties or out the back doors of the bigger brothels when the sun was high. Clutching pennies, they often came in twos or threes. They crowded around her mother, the fortuneteller, squeezing young Antonia back into the corner behind the curtain that hid the single bed she shared with her maman. They all wanted the well-worn cards or tea leaves to yield up promises of future husbands—tall, handsome, but most important, rich. Men who would love them and never leave them. Later, when dusk fell and candles were lit, the men showed up. Most had clothes bleached colorless from endless prospecting, or powdered red from hard-rock mining, and faces gnarled and creased as old pieces of wood. The men never asked about love. What they wanted was for maman to take their hands, first left, then right, trace the lines across their callused palms, measure the fleshy hills and valleys across the span, calculate theshape of their fingers, and from this swear to them that they'd make it rich, if not today, then tomorrow, or maybe next week, but no later. They all waited calmly enough, but weren't so calm when maman didn't tell them what they wanted to hear. Antonia's fingers curled tight around the pistol. She clicked the cylinder from chamber to chamber, timing the small snap, snap, to the distant pounding of the stamp mills. Mind inward, she thought about the mysterious Mr. Brown and her mother. Antonia had never met Mr. Brown. In fact, if it weren't for the hard reality of the gun, she'd have doubted his existence. When Antonia and maman had lived in Denver, Mr. Brown had been a regular client. While Antonia was learning her sums at school, he'd slip into the hotel where they lived to have his fortune told. When maman talked to Antonia about his visits, her eyes would shine and the small lines between her straight dark eyebrows would smooth out. And she always miled. "He's kind, Antonia, always polite, wears a top hat and fine clothes. A beautiful voice—he comes from over the sea, same as we did. Ah, but you were so young, a baby, you would not remember before we came to America. He listens and takes care of us. You know he pays for us to stay here, in this nice hotel? Someday, I believe, we will be a family. How can it be otherwise? He wants to meet you, soon. Then, you will see what I say is true." Antonia didn't want to meet Mr. Brown. She and her mother were already a family. They didn't need a stranger in a top hat. They had each other. But Antonia couldn't say this to maman's shining face. She could only swallow hard and nod, hoping that, Mr. Brown or no Mr. Brown, they could stay in Denver forever so she could keep going to school. In fact, it was Mr. Brown who sent them to Leadville. He made them leave Denver. Her other said Mr. Brown had provided the gun for protection until he could join them, just as he'd provided the train tickets to Leadville, and the money for staying in the hotel until he could come for them. The hotel had been expensive, and so had the food. It wasn't long before the money was gone and no more came. After that, all they had left of Mr. Brown was the gun, a carpetbag of his clothes, kept under the bed, and her mother's unshaken belief that he would come for them...someday. When Antonia had pressed her mother, maman had only caressed the gold and silver engraving on the revolver and gently touched the initials WPB carved into the ivory grips. "Why would he gift us with such a powerful means of protection, and so valuable, if he was not going to follow? Besides, I have seen it. I have seen you, ma fille, in a blue dress, so pretty, so rich, stepping from the train, and the men bowing to you like a queen. It will be so, because of Mr. Brown." Antonia couldn't stand it when her mother said, "I have seen it." She always said the words as if there was nothing more to say, as if those were the final words, words that sealed the future. She hated her mother's faith in her second sight. That faith never wavered, even as they starved and lived in filth and even when the men hit her maman when she said things they didn't like and when some of the women shunned her—she's a witch, she's a fake, she's a Gypsy. She hated it most when her mother talked about her own, Antonia's, future as if it was sealed and done, and there was nothing she could do about it. So, when one of the men, smelly and dirty, had come into their one-room shack while Antonia was there, and said, "Such a purty girl you got there, got such purty hair, all growed up, I'll bet, and eyes jest like your'n," and grabbed Antonia's long black hair with one dirty hand while he'd tried to grab the top of her dress with the other, she'd kicked him. Maman had leaped up, screaming, and the candle on the table had leaped as well, almost toppling to the dirt floor. The sudden tallow flare had flashed on the knife in her mother's hand. Pushed her way through the startled men waiting outside the shack and kept going, into the warren of shanties and cribs that clustered hodge-podge in the State Street alley. She kept running even when she heard her mother's screams change in pitch and volume. Later, when she crept back and saw her mother, face beginning to bruise and swell, Antonia burned with guilt for not running back to the shanty and beating the dirty man with her fists. Her mother had not scolded, but hugged her. "What could you have done, little girl that you are? You were right to run from danger. The other men, they came in and beat him, then took him away." Always the men, that was who Antonia's mother turned to for help. Well, it would be different now. That terrible night, while her mother slept deep under the spell of something from a bottle, Antonia had slid the worn carpetbag out from under the bed. Her mother didn't stir when Antonia extracted the shears and chopped off her own long, dark hair. Nor did she stir when Antonia dug deeper into the bag and pulled out Mr. Brown's togs. Antonia could hear her mother's voice in her head as she undid the buttons and set them on the small table in the dark: "He gave us his money, his clothes, his gun. He will come. I have seen it." Her mother's voice ceased when Antonia ripped off her own bedraggled sweat-stained dress, and donned Mr. Brown's clothes: three shirts, no collars or cuffs, two pairs of trousers, one pair of suspenders, a belt she had to wrap twice around her waist, and a thick gray wool jacket, warm, soft, long enough to be a coat. She rolled the sleeves and trousers up, but the pant cuffs still dragged in the dust. Later that night, she stole a hat and boots from a drunk passed out behind the Silver Queen. Or maybe he was dead? Antonia didn't know or care. He was a small man, but she still had to stuff the toes of the boots with paper and rags. There were always dead or dead drunk fellows in Stillborn and Tiger alleys, behind the saloons, dance halls, and houses. And, if you were sneaky and fast—she was both—you could snitch a pair of gloves, a copper penny, even a pocket watch, if you were careful. She'd traded the pocket watch for a cap and a nickel from one of the newsboys, Ace, that little thief, who really should have paid her more. She'd taught him a lesson, though, by going to the newspaperman he worked for and getting herself hired as a newsie. Still, being a newsie didn't pay as well as emptying the spittoons at the State Street saloons, so she did both, and swept up the floors too, if asked. That was always good for finding coins in the sawdust, dropped and overlooked. Antonia wanted to buy a carpet for maman to cover the shanty's bare floor. And then, someday, she'd buy them both train tickets back to Denver, and buy a nice house, too, and they wouldn't need Mr. Brown or anyone, because they'd have each other. A bird screeched from a tree, shattering her daydream. Antonia shook her head. She hadn't taken this precious time, when she could have been hanging around the newspaper office with the other newsies, or selling newspapers at the train station, or tipping buckets of spit into the alley behind the Silver Queen, to go off woolgathering about the future. Nope. She was here to practice on how best to kill a man with one shot. She brought up the gun, sighting on the first bottle. The initials on the grip pushed against her palms: WPB. "Worthless Pisspot Brown," she whispered. "You ruined our lives. You made us leave Denver—for nothing. If you ever show up, I will kill you." Sighting carefully, deliberately, from one bottle to the next, Antonia cocked the hammer and pulled the trigger, three times. One by one, the bottles exploded in a rain of sparkling glass.